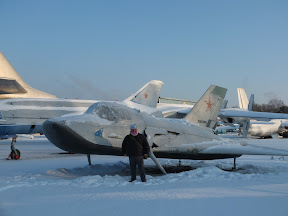 Today I visited Monino for a pre arranged trip to what was part of the Gagarin Air Force base, but it has actually recently been placed into non military hands. 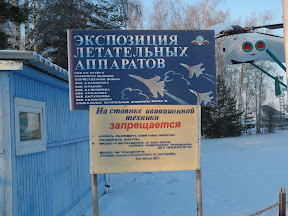 It’s about 40km to the North East of Moscow – it took me about an hour and a half to get out there by car. It’s actually hidden on the outskirts of a suburb, and there are few signs. 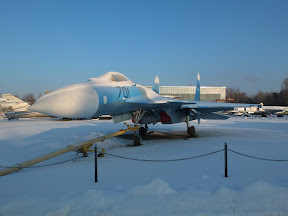 I had high hopes for this trip, and they were met in every respect – it is a truly amazing place to visit if you have a passing interest in Cold War aviation. If you happen to be a aircraft anorak you would find this place pant wettingly exciting. There are planes here that you cannot see anywhere else in the world, and in fact that were a total secret until the late 1990’s. I hired a local guide (Natalia) as well as Alexei again (my Moscow guide) as my interpreter – together with the car and the permissions to visit it must have cost me 15000 Roubles (£300), but money very well spent.. Sadly I have too many pictures to post here, but just a few to wet your appetite for now.. 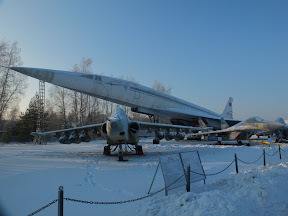 I will start with the M-50 strategic missile carrier (Bounder) – perhaps the most amazing and space age of planes I have ever seen…and it’s huge. This is a plane form the late 1950s! Aircraft 105 was a test bed for high altitude (edge of space) research – I think it’s just incredible.. and it lands on skis! 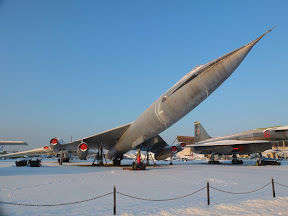 The TU-144 (Charger or “Concordski”).. 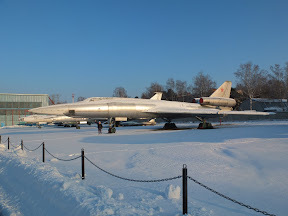 The TU – 22 Bomber (Blinder) – that’s me under the front nose gear for scale! 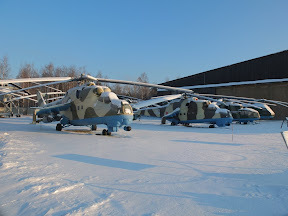 More helicopters here than I have ever seen before (two fields of them), mainly MIL.. I spent around three hours here – were it not for the temperature I could happily have spent three days. The staff seemed really pleased to look after me knowing I had come so far, and they even opened up an area that was officially off limits. A very special place to visit.